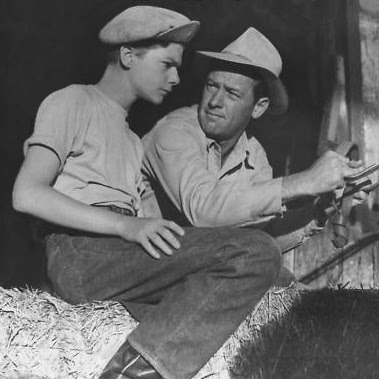 Virginie Pronovost, our host at The Wonderful World of Cinema, is giving us her 2nd Annual Golden Boy Blogathon, A William Holden Celebration. HERE is where you will find all the tributes. "A year ago they'd be calling him at the Ritz." 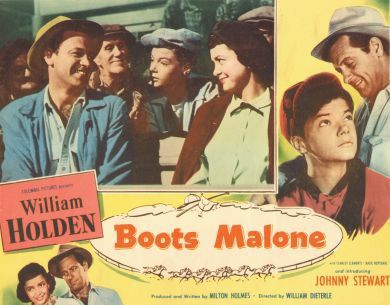 Jockey's agent Boots Malone played by William Holden is down on his luck. Three years ago, his jockey and friend died in a race. It was a complicated relationship and Boots, not being particularly good at interpersonal relationships, hasn't picked himself up from the hurt, which was piled on another long ago hurt. The deeply buried heart of the character is surrounded by a layer of prickly cynicism. He is respected as a track man and his friends know just how close they are allowed to get. Boots is living in a stable at the Dellington Park racetrack with training rider Stash played by Stanley Clements (Going My Way, Canon City) and horse owner Preacher played by Basil Ruysdael (Raton Pass, The Horse Soldiers). Each act of kindness that Boots, almost subconsciously, makes is quickly followed by a quip or snarky remark. Into this tight, yet informal group comes a runaway they call The Kid. The teenager played by a baby-faced Johnny Stewart is well-mannered, bright and somewhat out of place. Nonetheless, the boy loves horses and yearns for life on the track. The Kid is even willing to pay Boots to train him as a jockey which Boots takes on grudgingly, alternately using and being kind to the youngster, whose name he eventually discovers is Tommy. Major conflict arises when Howard Whitehead, a businessman played by Ed Begley (12 Angry Men, Sweet Bird of Youth), who is hungry for wins, takes Preacher's beloved mare "Mother" in a claiming race. This goes against an unwritten law about taking a one horse owner's one horse away from him. The stable workers band together in a complicated plan to teach the wealthy interloper a lesson. The plan involves Whitehead's trainer helping convince Whitehead that a "sleeper" in his stable is actually not worth keeping and to put him up for auction. The stable hands have pooled their resources to buy the horse on the prospect that Preacher is the owner of record. Boots and Stash will take on the job of training the horse to take down Whitehead in a big race at the end of the season. The character actor faces of the stable hands match the fanciful character names, as colourful as those given to horses. Goofy Gordon, Quarter Horse Henry, Louis the Louse, Foxy Farrow, Hancock and Spaniard. Taking the horse out of state to train, Boots, Preacher and Stash discover that the jockey they have been lacking has been under their very noses. Boots starts to train Tommy in earnest. The training is a fascinating part of the picture as the many intricacies of riding a race horse are drilled into the boy until they become second nature. Just as they are about to cap off the plan back at Dellington Park the life that Tommy has been running from catches up with them. The culmination of Tommy and Boots emotional journey, and the exciting horse race finish of the film is both sensitive and thrilling filmmaking. William Dieterle (The Hunchback of Notre Dame, Portrait of Jennie), the German actor turned director was in charge of this and Holden's next picture, the crime drama The Turning Point. There is not a slow or draggy part in this story, yet none of it feels rushed. We are given every opportunity to soak up the racetrack atmosphere and the interesting characters who inhabit that life. William Holden, being the actor that he was, who always holds the viewer in the palm of his hand with his pent up emotions and offhand manner, wears the character of Boots Malone like a well-tailored glove. Boots Malone has long been one of my favourites among his roles and filmography. Time has only added a lustre to my nostalgic glow. I have movies like that in my memory where I saw a portion then had to leave or lost interest. Years later I'm usually happy that I waited to see the entire thing. I think we see or read things at the right time. Thank you for hosting this blogathon and thank you for seeing past your dislike of the film to commend my contribution. Not every movie speaks to every audience. That's what makes sharing our thoughts on movies such a wonderful and interesting way to spend time. Thanks for reviewing one of William Holden's lesser-known movies. I think he's quite good in this entertaining tale of redemption. Hopefully, TCM will show it soon because I haven't seen it in a long time. I just saw Stanley Clements in a PERRY MASON episode! Isn't that always the way? You see a guy in one thing and he pops up in something else. Our entertainment universe is funny that way. I truly think this is something a lot of TCM fans would enjoy seeing on the network. Whether as something new or something they'd almost forgotten about. Prickly cynicism disguising a deeply-buried heart - that sounds like a Holden character, all right. It doesn't sound attractive, but it is certainly relateable. I loved the last paragraph. Well-written review of another movie I have yet to see. Thank you. I think you will find this film interesting and worthwhile. You're always welcome. Any kind comments you get from me are sincere. You always introduce me to new films! I hadn't heard of this one before, but your review has encouraged me to record it the next time I see it on TCM's calendar. Bill Holden alone makes it worth a watch! Glad to hear that this is an introduction. That's a big part of the fun of classic movies. Indeed Holden is always watchable and here he has a character to match his intensity. I've never seen this, but I do like horse-racing movies, so if it ever crosses my path, I will definitely give it a try! It's so nice that there is a "new" track movie for you. It does a find job on the atmosphere front and I think you will like it.